Music: Sufjan Stevens, Illinoise. At first a bit fruity, simple, and more “Pop” than you’re looking for. But once you get a taste, it’s deep, soulful, flavorful, and intense. The perfect call when you need a little something to help you get through the day. The perfect ripeness for perfect banana bread. So, I’ve made a lot of different recipes of banana bread. Once, I even added coca-cola thinking soda meant coke. I was 19, don’t judge. But BJ and I love banana bread. Really love it. BJ will toast it and schmear with butter, meanwhile, I have gobbled my pieces and am picking the crumbs from the plate. Anyways, back to the recipe…I’ve tried a lot. 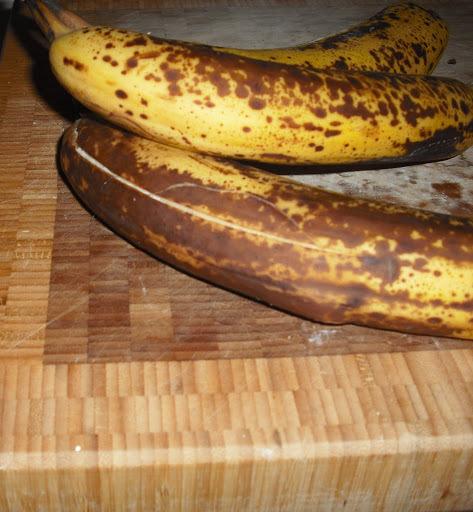 Most call for two bananas and if they are old school recipes, vegetable oil…eeewwww. I got the Cook’s Illustrated bible (The New Best Recipe, 2004 edition) a few years back and it is by far the best banana bread. Why?? Simple. Three bananas and yogurt! It is really moist, but still has a ton of flavor. I keep the bananas pretty chunky and add a good amount of yogurt (more than it calls for) and yummmmmmm. The only other banana bread to compare was a whole wheat honey banana loaf I made once. I guess since I mentioned it, I now have to make it! 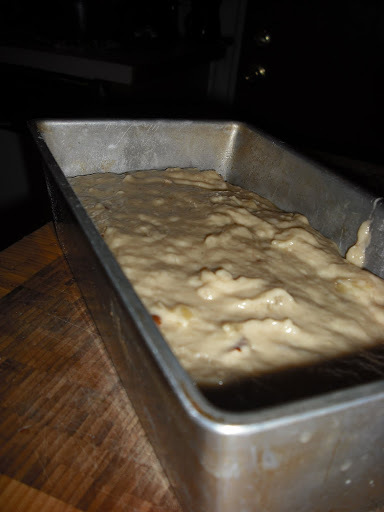 With fall upon us, banana bread is a go to baking recipe for us all, so enjoy my fave. And look forward to some more comforting fall foods ahead 🙂 Oh yea, sorry for the lack of pics of the finished product…did I mention that we LOVE banana bread?!?! Preheat oven to 350. Grease 9x5x3 bread pan and dust with flour, tapping out any excess. Spread nuts on baking sheet and toast until fragrant about 5 to 10 minutes. Cool. 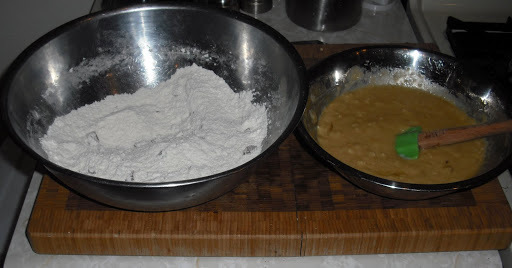 Whisk together dry ingredients: flour, sugar, baking soda, salt and nuts; set aside. Mix the wet ingredients: mashed bananas, yogurt, eggs, butter, and vanilla. 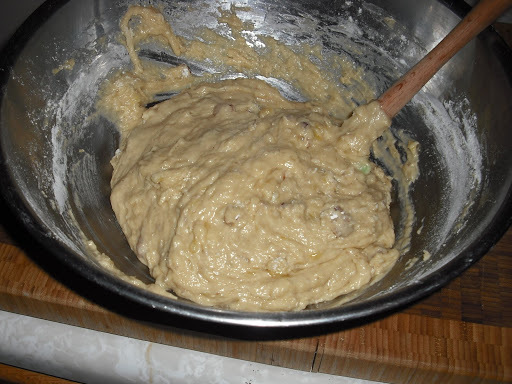 Lightly fold banana mixture into dry ingredients, until batter is just combined and looks chunky. 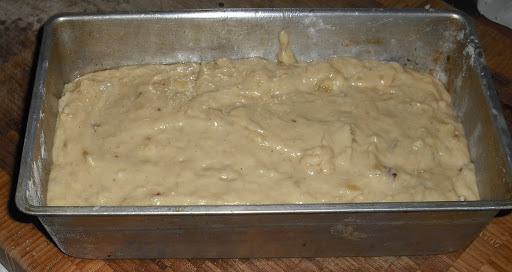 Scrape into prepared bread pan. Bake about 55 minutes; until loaf is golden brown and toothpick comes out clean when inserted. Can be wrapped in plastic and stored for 3 days. This entry was posted in bread by callywoodfarms. Bookmark the permalink.